Joe Flynn was born in Killorglin on the 2nd of May 1957. He lit up the soccer pitches of Kerry for many years and had a fantastic career in the Kerry District League. Joe played for Callinafercy, his local team in Killorglin with whom he won the Cup and League double in 1979/80. Joe joined Tralee Dynamos the following season and settled into the team quite easily where he lined out at midfield with some of the great Dynamos players of that era. He repeated his unique League and Cup double with Tralee Dynamos. Rumour has it he is the only player to achieve League and Cup doubles with two different teams. In his 16 year playing career he picked up winners medals in every major domestic competition in the Kerry District League. Having played with Callinafercy and Tralee Dynamos Joe finished his playing career by winning a Reserve Cup medal with Shanakill. A lifelong Leeds United fan his last night out in Tralee was with the Kerry Leeds United Supporters Club for the Leeds vs Wolves game. Joe was presented with a signed Leeds jersey on the night. He was in top form even though he was fitted with a pain relief morphine pack, he could be heard cheering his team on. Joe received a phone call the day before he was admitted to hospital from the legend Johnny Giles who told him his positive attitude was inspirational and to keep fighting. 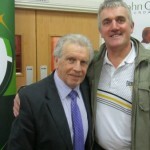 Joe was overwhelmed to get this phone call and had the pleasure to meet Johnny Giles at an awards night in Mounthawk Park Tralee a few years prior. He had his photograph taken with Johnny and it had pride of place in his home. Joe was a sign writer by trade, he had a massive passion and skill for hand painted signs and his work can be admired all over Ireland and in particular Tralee town. Joe was first diagnosed with oesophagus cancer in June 2014. He received his first chemo/radium treatment on 28/07/14 start of his journey. It was a great shock to all of his family that he had cancer and from the very beginning he was extremely strong and positive. The doctors gave him 50/50 chance of survival. In March 2015 Joe was given great news and was cancer free for 10 weeks. He celebrated in Flynn Style having a benefit night in McHale’s Pub in Causeway. It really was a night to remember, Joe was overjoyed by the support from family and friends. In August Joe found a suspicious lump in his stomach and at first he thought it was something small but unfortunately it was cancer. This time it was in-operable and it was devastating news. Joe was given 3 to 5 months to live. There was a lot of tears and anger no matter what length of time the doctors gave him his family wanted more. Joe took the news in his stride and decided that he would not be waiting for it to happen, he would live his life and try to continue as normal. Joe said he was very grateful to have seen all his family be successful in life and work. He had been married to an amazing woman Breda for 36 years had 2 children Bernie & Joanne and granddaughter Caitlin. Joe also had the pleasure to see both daughter’s grow up get married to two great men, he had a great friendships built with his sons in laws Karl and David. They both assured Joe they will always love and mind his daughter’s and his wife Breda. In November Joe decided to go public with his cancer journey in connection with Movember Mens health awareness .He felt very strongly about men’s health and wanted to put a positive spin on such a sad situation. All his family encouraged him all the way. His story reached Ray Darcy’s RTE radio show and both his daughters Bernie and Joanne had the pleasure to watch Joe in action. He talked about dying very openly and said that he was not scared, only sorry to be leaving. He was honest and straight which captured the hearts of the listener’s and in doing so even made Ray Darcy cry. There was a very unique day at Tralee Dynamos in November 2015. It was an awful day weather wise but over 50 players from many decades put on boots many for the first time in years and played a game of soccer. They did this to honour Joe and thank him for all that he did for the sport over the years. No one cared about the rules, how many a side played or who won. It was all about taking part. Over the last few months Joe had known his fate but had shown remarkable courage and bravery in his fight. Joe had the last laugh on his lifelong friend Seamus O Mahoney, a well -known referee and former team mate of Joe’s who is a staunch Manchester United fan. Joe requested him to wear his newly signed Leeds United jersey for one of the offertory gifts in the church. Fair play to Seamus he wore the jersey with pride for his good humoured friend. So finally we would like to say to the man that painted that beautiful sign, finished that impossible dart double, that scored that winning goal, put a smile on our faces and always had a listening ear, had a huge heart, till we meet again Joe, your sadly missed by your loving wife Breda Flynn daughters Bernie & Joanne granddaughter Caitlin, sons in law Karl & David, mother Kitty Flynn brothers and sister family and many friends. Joe’s passing at such a young age is very sad, but his life is a beacon to all as to how we should live life, how we should battle adversity and how we are much stronger together. And for showing us these things Joe Flynn, we are eternally grateful to you. RIP. Many thanks to Bernie Flynn Hart, Christy Leahy and Padraig Hartnett for their input for this article.